It's part of his campaign for Omaze to help raise money for Christopher's Haven. By Lisa Weidenfeld·	 1/19/2017, 10:53 a.m.
A group of innocent Comicazi customers got more than they bargained for at a recent visit to the Somerville comic book shop. A Captain America doll started asking them to join him on a mission to stop Hydra. But it wasn’t just a doll with a built in recorder—it was actually Chris Evans in a hidden room, giving them instructions. It’s all part of his campaign for Omaze to raise money for Christopher’s Haven, a nonprofit that offers housing for families who have kids being treated at local hospitals. Omaze is also the organization that offered a pizza date with Tom Brady, Ben Affleck, and Matt Damon. 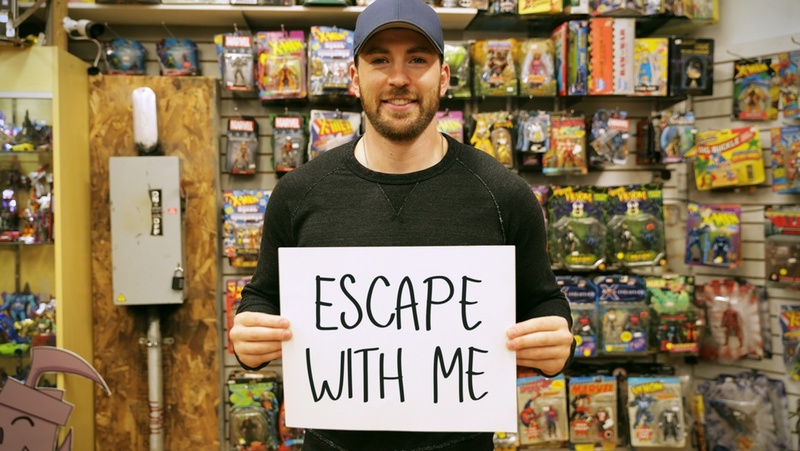 The charity offer Evans is promoting is an Escape the Room adventure, but as he discovers in the smaller scale version he filmed to promote the event, directing people on a mission is harder than it seems. His unsuspecting victims misinterpret casual comments he makes, miss a giant banner with a clue on it, and in the first interaction, reject his mission entirely. So much for saving the world. You can see the whole video below, but if you’d like to win the chance to play the game with him, entry details are available here. You’re also welcome to explore Comicazi on your own time to see if Chris Evans is still hanging out there. Just don’t turn him down when he asks for your assistance in defeating Hydra.